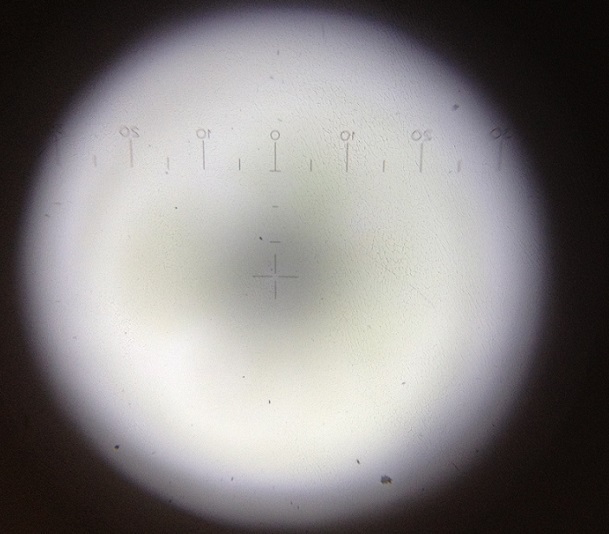 I am having some trouble with the eyepiece AFOV calculations resulting in low numbers, like 77.6 degrees for a 31mm Nagler, for example, and looking for some help in understanding this result. I have an eyepiece spreadsheet I found online to compare eyepieces, and I noticed that the spreadsheet uses a calculated eyepiece field stop, from the published AFOV, the focal length of the eyepiece and the telescope objective lens/mirror focal length. So, what am I doing wrong? Or is the apparent field of view really 77.6 degrees for an "82 degree" 31mm Nagler? I don't think so, because all of the eyepieces for which I did this calculation, showed results that were lower than their published AFOV. You haven't introduced the focal length of your SCOPE into the calculation using the second technique. So for a Tak FS128, at 1040 mm FOCAL LENGTH OF THE SCOPE (aperture in mm times the focal ratio), so the 128 mm aperture Tak FS128 is f/8.1, 8.1*128=1036.8 mm, so you can see I've rounded a bit, but 1040mm is good nuff. 82 afov / 33 = 2.48. This is pretty close to the field stop method. Televue says the Nagler 31 is actually 42mm field stop so (42/1040) * 57.3 = 2.31 so you can see that with the extra mm we have narrowed the distance between the field stop calculation and the approximation formula. The difference between field stop and approximation is 1.7 tenths of a degree or only ten arc minutes out of 2.3 degrees, so it's a pretty good approximation. Edited by gnowellsct, 11 May 2017 - 09:46 PM. Sorry, maybe I wasn't clear, but I want to encode these calculations into this extensive eyepiece spreadsheet I have. So an interactive website isn't really the kind of help I was looking for. I need to understand the underlying calculations so I can use them to modify my spreadsheet. Yah I put up a more detailed explanation in the second post,which you might not have seen when you wrote this. 'Apparently' this difference has to do with distortion. I would like to understand it a little better myself but yes you are correct. Now try the same with the Type 4 Naglers and you will find the numbers are very close to 82 deg. In fact compare the 13NT6 and 12NT4 side by side one in each eye and the 12NT4 apparent field appears larger and the field stop diameters (17.6mm for 13NT6 and 17.1mm for 12NT4) seem to confirm this as they are very close. The true field of the 12NT4 is almost that of the 13NT6 yet there is a 1mm focal length difference so apparent field has to be larger. The percentage difference between 12 & 13 is not the same as the percentage difference between 17.1 and 17.6. I understand distortion plays a part an am not sure of the calculation for it but I do know that when I look through the 12NT4 the apparent field appears 'apparently' larger that that of the 13NT6. Perhaps the extra eye relief and larger eye lens of the 12NT4 plays a part here but when I put them side by side with one in each eye at a blue sky the 12NT4 looks bigger and I can see the edge in both. I haven't tried reversing the eyepieces L/R as my right eye is my dominant and observing eye so I'll test again to see if it makes a difference. 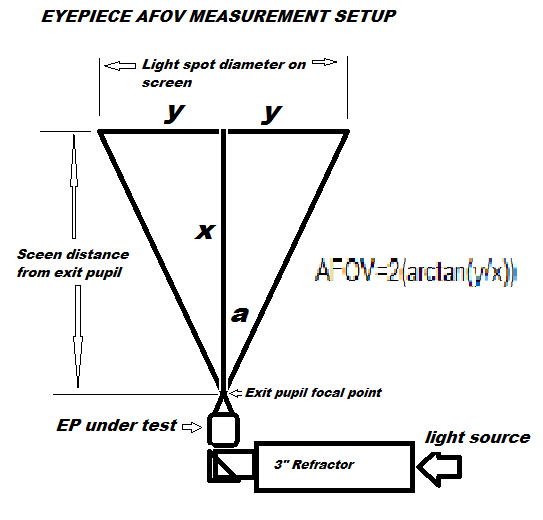 No the OP is not calculating true field and is using the formula independent of the 'scope focal length and substituting the eyepiece focal length to work out the apparent field. There was a discussion about this a while ago and someone called it the 'pseudo' apparent field so maybe do a search for it. I cancelled it out in my substitution calc. The apparent field is independent of the scope, as you can look through just the eyepiece, with no scope present, and see the apparent field. So the scope focal length is irrelevant. That's correct, the EP AFOV is independent of scope. With a bit of smoke in a dimly lit room, you can SEE the exit pupil crossover point and measure from there to the screen where the light circle is projected to ( I just use the white ceiling as my screen). Edited by Bob4BVM, 11 May 2017 - 10:47 PM. It is possible to derive a field stop because that relates to the true field you see on the sky. It is NOT, however, possible to derive an apparent field unless you know the exact amount of distortion and type of distortion. You read that correctly--apparent field and field stop are only loosely associated. Say the field has a compression of size at the edge. A star would drift slowly across the edge and fast across the center and then slow again before exiting the field. In that case, you would calculate a large field stop because a star timing would yield a large true field, but it would be compressed into a smaller apparent field. Change the distortion to expansion at the edge of the field and the same apparent field would yield a smaller field stop and smaller true field. how much field can be seen--the iris measurement could be misleading. Only in eyepieces free of distortion ("orthoscopic") would a measured field stop iris tell you the actual true field. taking distortion into account, and all eyepieces larger than the field size of a Plössl have plenty of distortion. Assuming the field stop of the 22mm T4 Nagler is 31.1mm as claimed and that it has been calculated in order to yield the correct amount of true field, then an apparent field of 31.49mm is derived from an 82° apparent field. what TeleVue shows. But that would mean there is zero distortion, which is impossible in such a wide eyepiece. We can figure out from the diameter of the eye lens and the actual eye relief what the maximum apparent field can be, but we cannot know if it is smaller than that without the flashlight test. The light path through the eyepiece, you see, might not use the entire eye lens diameter. As you state: "We can figure out from the diameter of the eye lens and the actual eye relief what the maximum apparent field can be, but we cannot know if it is smaller than that without the flashlight test. The light path through the eyepiece, you see, might not use the entire eye lens diameter." 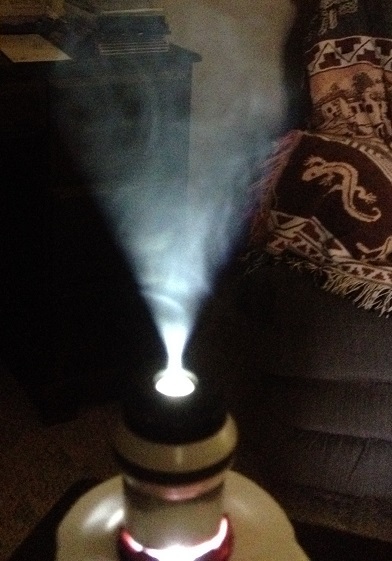 That's one reason why I like the flashlight test-aside from giving me a direct honest measurement of AFoV, I also get a "live raytrace" of the light path(s) visible in the smoke. The rays become visible so I can see how much lens diameter the light path is using. What may not be clear in the picture above is that I could actually see the wide base of the light cone exiting the EP eye-lens at the lens surface, below the EP crossover point. That kind of visualization is a very powerful tool when one is playing with lens arrangements, as on an optical bench setup. It was essential for me when I was testing lens arrangements & spacings for my 3-inch EP project. Edited by Bob4BVM, 12 May 2017 - 12:51 PM. Bob, thanks for the wonderful illustration for making the AFOV measurement! I love that & will give that a whirl at some point. I appreciate the explanation of distortion and it's effect on calculating the AFOV. I'm still learning! The above calculation is the same as what is used in the spreadsheet I have, and results in a value of 44.4mm for the field stop of my 31mm Nagler, and a 2* 8.6' true field of view. This difference from Televue's published field stop value of 42mm is what first got me suspicious of the field stop values I was seeing in the spreadsheet, and when I started adding the Celestron Silvertop plossls to the sheet, the calculation was also coming up different for the 30mm, which someone here on CloudyNights.com reported as having a 28mm field stop, but yields 27.2mm using the above calculation. I don't mind just leaving the published AFOV values alone, but I would really like to be able to reconcile the true field and field stop values a little more closely. ...because it looks to me like throwing the AFOV value into the calculation for FS is what introduces the difference, due to the distortion effects...? For my 8" Newtonian f5.837 (1186mm TFL), using the published FS value of 42mm drops my true field down to 2* 1.7'. I can live with that! Edited by leifyjai, 12 May 2017 - 07:08 PM. I think you have that correct. The TFoV does not depend on the AFoV or the focal length of the eyepiece, it only depends on the focal length of the telescope and the size of the field stop. The telescope provides an image at the focal plane and the field stop determines how much of that image is visible in the eyepiece. If you have a field stop from the mfr, use that for true field. And use mfr afov for afov data. But do not try to reconcile the two. Edited by penguinx64, 12 May 2017 - 11:49 PM. If you have a field stop, that will give you a more accurate true field calculation using Leif's formula in post #11. Thanks for all the useful input! I now have a much better handle on how to modify the spreadsheet I'm using, and make it more useful to me. Plus a cool way to measure the AFOV for the cases where there is no manufacturer spec or where it seems exaggerated!